My week started out looking like the most exciting thing I’d be doing this week was holing up in my office posting cymbals on my website. Monday afternoon I get a call from the legendary Simon Phillips. He says he’ll be in town tomorrow with Japanese jazz pianist Hiromi. He’s renting a kit for the show but the back line company doesn’t have any octal-bons. He want’s to know if I can find him some by the next day. I don’t have any or know anyone who does. This is where knowing virtually every drummer in the northwest comes in handy. After a few calls, texts and Facebook posts I have octa-bons coming out of my ears. My old friend Jeff Mills has a set and agrees to bring them down to the club. Simon hooks him up with some tickets and everybody’s happy. About an hour later I get a call from Steve Smith. He tells me he’s coming to town with the Masters of Percussion with Zakir Hussain for a show at the Moore Theater on Thursday night. He says he’ll be coming in Wednesday and is planning on going to see Simon and Hiromi so we all arrange to meet up at Jazz Alley. 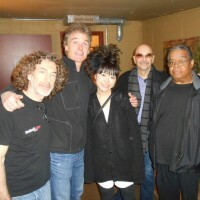 Steve shares the Hiromi gig with Simon. 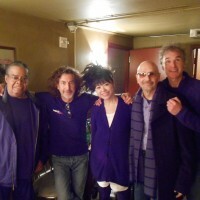 If you’ve never seen Hiromi she is an amazing jazz piano player. Her music is very complex and the drum parts are nearly impossible. She always chooses the very best drummers and gives them plenty of room to move. I was extremely fortunate to be able to watch Simon Phillips, one of the greatest drummers in the world, while sitting next to Steve Smith, another world great. Steve patiently coached me along explaining the complex time signatures and arrangements as they played. Not a bad wednesday night.